If you’re here reading this article, I’m sure you’re a fan of cakes and it’s not just a single flavor that appeals to you. Over the years, the details, designs including varieties of frosting, cream and color have become more and more versatile with diverse, delicious, finger-licking awesome flavors because when it comes down to it, what matters most is how the cake finally tastes! 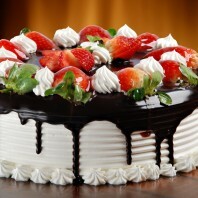 Here are the top ten most popular flavors of cake you should not miss! “Let’s face it, a nice creamy chocolate cake does a lot for a lot of people; it does for me.” – Audrey Hepburn. From dampened moods to heartbreaks, there is nothing chocolate cakes cannot cure and if you are a chocolate lover you would accept that chocolate cakes are the very examples of sheer decadence. Chocolates can be paired with almost anything to provide multifarious levels of richness and remains one of the most sought after cake flavors by both children and adults. Vanilla cakes are quite often thought to be bland, common, old-fashioned and tame but they are anything but that. Vanilla flavor has exotic origins and a plain vanilla cake makes for an excellent base for many fun and fruit flavors. For those who like to keep things simple, a classic vanilla cake topped with vanilla or fruit toppings can never go wrong and its subtle taste is sure to be a hit. Vanilla flavored cakes are definitely here to stay! A fitting name considering the deep red color and velvety texture this cake imparts. A relatively recent newcomer, red velvet cakes are soaring in popularity with their rich and smooth texture, chocolaty-vanilla flavor and apt pairing with cream cheese frosting. The beautiful hues in this cake delivery represent love, passion and romance and are best for your loved one’s birthday or as wedding cakes. Made using the fines of ingredients and walnuts rum cakes are hand glazed with premium rum or rum mixed in the batter and the delicious freshness and taste is locked in with little or no icing. If you have never had a chance to experience the exotic taste of rum cakes, I urge you to do so immediately. Tangy and light with a hint of tartness, citrus flavored lemon cakes are the best choice for people with a taste for sweet and sour in their desserts. This cake is not too heavy but can be made rich by pairing it with raspberries or strawberries and whipped cream to make for rich fruity blend or simply served with lemon butter cream frosting for that luscious taste. Bananas are a versatile lot with their inherent sweetness and incredible flavor especially when used as the prime flavor in cakes. If you have tasted banana split and loved it, these cakes are a good choice for you and they also go well with a variety of icing and topping options. A non-traditional flavor you might think but carrot cakes have been in existence since the middle ages. Grated carrots and chopped nuts form the crux of the batter and end result is a soft, dense cake with great consistency. These are delicious as standalone cakes or paired with cream cheese frosting. This tasty flavor combination is reminiscent of a tropical holiday is perfect for those wanting a sweet rich cake and do not want to choose the chocolate family. This is an ever popular choice everywhere in the world and can be eaten with any simple frosting and pineapple slice toppings for a rich and creamy experience. Layers of chocolate held together by whipped cream icing, topped with cherries or grated chocolate, the classic German Black Forest cakes find appeal with those who want something that is chocolaty and yet not traditionally so. Cakes aren’t what come to your mind when talking of peanut butter, but peanut butter cakes are more common than you think. A nutty, slightly flavored base cake topped with peanut butter frosting appeal to people who like less sweet in their desserts and are health conscious.